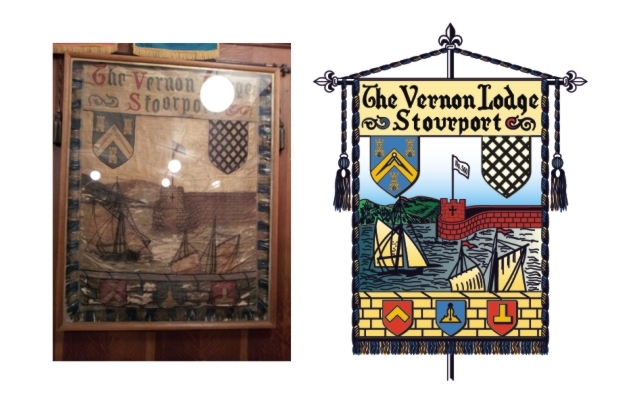 Many customers, ranging from posh hotels to pubs, come to us with a photo of their crest (coat of arms) which in many cases is over 100 years old. These customers want us to produce a vector image of their crest which they can then use for one of many purposes including printing onto business cards, embossing/engraving onto mats and embroidering onto staff uniforms/towels/bed spreads etc. Most of the time, the work involves simply to take the photo and convert the image to a vector. But sometimes the customer wants changes that require a level of creativity because it involves working on parts of the crest that can't be seen anymore. This kind of vector conversion is not a problem for us, since our vectorisation service does not involve using automated software to do the job, but instead involves manually recreating the crest from the photograph to produce a vector graphic file. If you look below - the photograph on the left is what the customer supplied (with some customisation requirements). The existing crest was over 100 years old with some level of deterioration. The picture on the right is a low resolution version of the Vector that was produced. We supplied the customer with an EPS file they could use to print their crest on to a canvas.